George Bailey’s struggle to grasp why life is worth living finds a fresh voice in this imaginative one-person retelling of Frank Capra’s classic film It’s a Wonderful Life. Penned by Helen Pafumi and Jason Lott, this memory play introduces a new generation to the residents of Bedford Falls, New York on a fateful Christmas Eve in 1945. 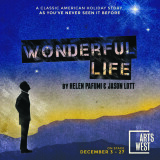 Wonderful Life is a heartwarming story about the effect one man’s sacrifices have on the people and town he loves. Wednesdays through Saturdays at 7:30 p.m., Sundays at 3 p.m. *No performances December 24 & 25. We are offering a special $10 student rush ticket for the run of WONDERFUL LIFE. These reserved seats are limited to 10 per show, and are available for purchase one hour before each performance. $17 advance student tickets are always available for purchase online or at the box office.